August 25, 2010 /PN - Hasseblad/ Bernhard Edmaier presents an awe-inspiring view of our planet. 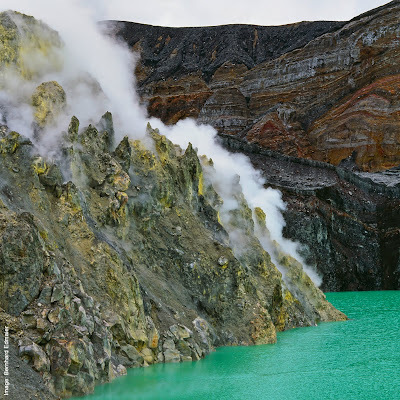 Published by Phaidon Press in November 2009, "Earth on Fire: How Volcanoes Shape our Planet" brings together 200 of his most spectacular photographs which reveal how volcanic activity has shaped the landscape of our planet. Over the last decade, award-winning aerial photographer Bernhard Edmaier (b.1957) has photographed some of the world's most dramatic and beautiful volcanic landscapes, amassing a unique archive of images depicting volcanoes both active and dormant, and a fascinating range of geothermal phenomena and formations. The result of meticulous planning and research, his travels take him from the endless deserts of Africa to the ice plains of Iceland and the coral of the Great Barrier Reef. 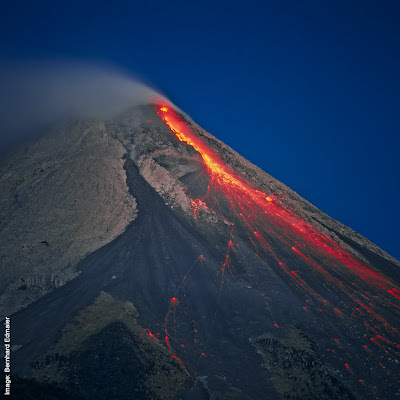 Every time a volcanic eruption hits the headlines, we are reminded of the fact that we live on a ball of fire, with only a thin layer of rock separating us from the furnace deep inside the earth. Lava-spewing mountains aren't the only evidence of the heat and activity below the surface either: there are also geothermal areas with hot springs, bubbling mud pools and encrustations of bright yellow sulfur crystals, as well as steaming acid lakes in often perfectly circular craters. 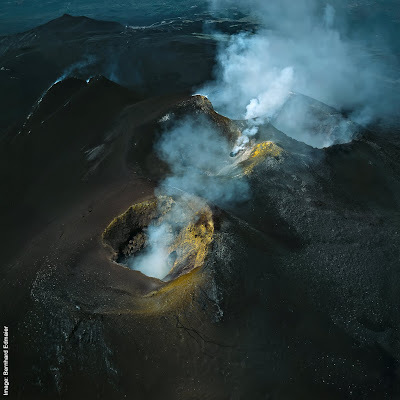 In clear, accessible texts, geologist Angelika Jung-Hüttl explains the phenomena and formations seen in Bernhard Edmaier's photographs which show volcanic formations around the globe - from well-known sites such as Mount St Helens in the USA, to remote volcanic landscapes in Ethiopia, Siberia and the Maldives. All of the images in "Earth on Fire" - which were taken over a period of ten years - were photographed with Hasselblad analog and digital cameras. Edmaier personally digitized the analog shots using a Hasselblad Imacon Flextight 949 scanner. For a first selection of fascinating images from the book "Earth on Fire", please visit www.bernhardedmaier.de. In his current project, the geologist and photographer once again presents breathtaking bird's-eye views. This time, his journey takes him and his H3DII-50 across the Alps from Nice, France to Vienna, Austria, where he captures striking images of the unique fold and overthrust formations that date back to the origins of the mighty mountain range. Edmaier is looking forward to using his new Hasselblad H4D-60 in his future work and travels. "In addition to my book projects, I also organize exhibitions of large-format prints of my pictures. The extra resolution of a 60-megapixel camera gives me reassuring reserves for my exhibition pieces, which are up to two meters square - especially when working with tight crops and detail views," he explains. Bernhard Edmaier (b.1957) trained as a civil engineer and geologist and has photographed the earth's surface for over 15 years. He has won many prestigious awards for his work. His volumes of photography 'Vulkane' (1994), 'Eisige Welten' (1996) and 'Geoart Deutschland' (2003) were consecutively voted The Most Beautiful German Science Book of the Year, and his 'Geoart - Kunstwerk Erde' won him a renowned Kodak Photo Book Prize in 1998.
newspapers and popular science magazines. She has worked and traveled with Edmaier for ten years and has written several books on volcanoes, ice and glaciers. did he shoot those photos with a hasselblad? Me uno a las felicitaciones, la verdad que me parece que el contenido es bastante .... Es muy interesante tu blog. Ich einer in den Glückwünschen, der Wahrheit, die mir scheint, dass der Inhalt genug ist.... Es ist dein Blog sehr interessant. Me one to the congratulations, the truth that seems to me that the content is enough.... Your blog Is very interesting.